More than a hundred years after its stage premiere, George Bernard Shaw’s sparkling comedy Pygmalion has been revived in a new production by Oldham Coliseum Theatre. Pygmalion tells the tale of Henry Higgins, an egocentric Professor of Phonetics who makes a bet with his friend Colonel Pickering that he can transform cockney flower seller, Eliza Doolittle, into a poised, well-spoken duchess. In 1956, the play became the inspiration for the musical, My Fair Lady, which opened on Broadway starring Julie Andrews and was subsequently adapted for film in 1964 starring Audrey Hepburn. 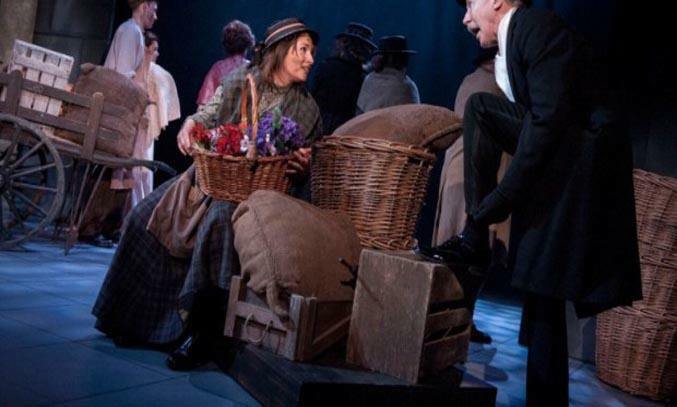 Warm, witty and wonderfully funny, Oldham Coliseum’s revival of Shaw’s classic story revels in the glory of the language, bringing Shaw’s sparkling dialogue to life. Director Chris Honer does an impressive job of immersing the audience into the restrictive middle class world of class and privilege while Michael Holt’s sumptuous set and plush costume design highlights the British obsession of social class and taste. James Simmons puts in strong performance as Henry Higgins, finding humour in the man’s bullying manner and social gaucheness, as well as capturing the sad limitations of a man incapable of love and intimacy. Christopher Wilkinson proves a delightful Colonel Pickering while Alwyne Taylor shines as the grand Mrs Higgins, clearly vexed by her son’s inadequacies. But the star of the show is undoubtedly Charlotte Brimble as the sassy Eliza Doolittle, who is not only wonderfully funny but also incredibly vulnerable. Brimble’s performance is luminous and refreshing, bringing a depth of feeling to the play and her re-enactment of the famous tea-party scene has the audience in stitches. A special mention must go to James Quinn who had the difficult job of stepping in as Alfred Doolittle just 3 hours before opening night after John Branwell fell ill. With a script in hand, Quinn performs like a real pro, earning a well-deserved applause from audience. While Pygmalion is a provocative comedy full of wit, the play isn’t without its weaknesses. Much of the narrative is repetitive with Eliza’s cockney “owwwws” and Higgins’ dictative nature proving tiresome after a time. Unlike the musical, the original play also omits to show Doolittle’s elocution lessons, which is arguably one of the most entertaining aspects of the story. One moment she is squawking and stuttering, the next she is passing herself off as a lady at Mrs Higgins’s tea party. That said, Shaw’s witty and clever script is still capable of entertaining a modern audience despite its age and even in today’s world, the play still has a lot to say about class, inequality and privilege. A rich and funny story of a young woman’s determination to better herself.